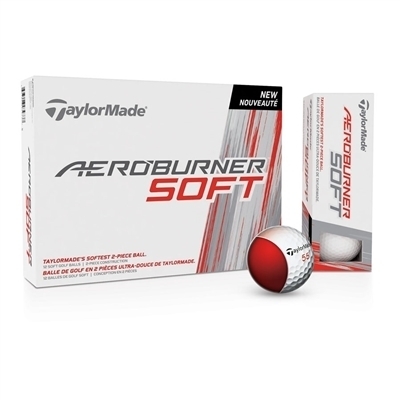 The TaylorMade Aeroburner Soft Golf Balls Goes Far. Feels Really Soft. Stops Fast. This is TaylorMade's Softest 2-piece ball. TaylorMade’s softest 2-piece construction ever, featuring a patented REACT core and a new lothane™ cover blend for a very soft feel and increased greenside control. No TaylorMade ball screams off the clubface as swiftly and softly as AeroBurner Soft. You'll love the long distance and how incredibly soft it feels, especially around the green. It's not just super-soft for a 2-piece ball, it's super-soft for any kind of ball. The speed comes from our high-energy REACT core that stores and releases energy with incredible efficiency. The long carry comes from our LDP 342 HIGH-LIFT, LOW-DRAG dimple pattern that launches high and sustains flight. The soft feel comes from our proprietary IOTHANE cover design to feel like it melts against the clubface at impact.